Wild Horses of Sand Wash Basin! Welcome to Sand Wash Basin! Sand Wash Basin is home to an extraordinary herd of wild horses. Located in the northwest corner of Colorado on public BLM land about 48 miles west of Craig, Colorado. Do visit the Sand Wash Basin Facebook page to view current photos as well as updates and information about the basin. 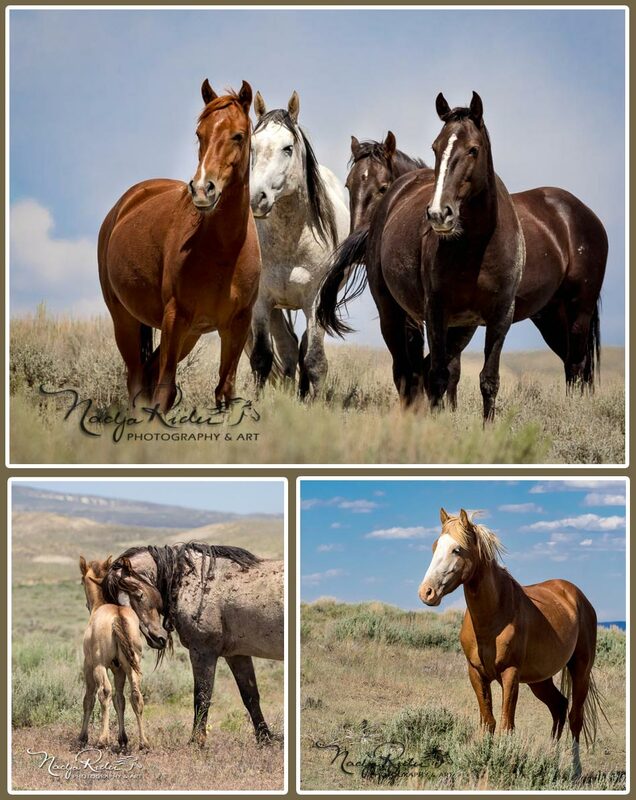 This website was created by Nadja Rider, a photographer with a passion for the wild horses! I'm not paid - simply a volunteer that helps document and monitor the horses. No one is currently licensed through BLM to offer guided tours, however if you visit our Facebook page, you will find many folks, including myself who are willing to offer tips and guidance for the first time visitor. If you wish to visit Sand Wash Basin, do review the location and FAQ pages for information. Sign up for the Sand Wash Basin Newsletter - we promise not to send out too many! 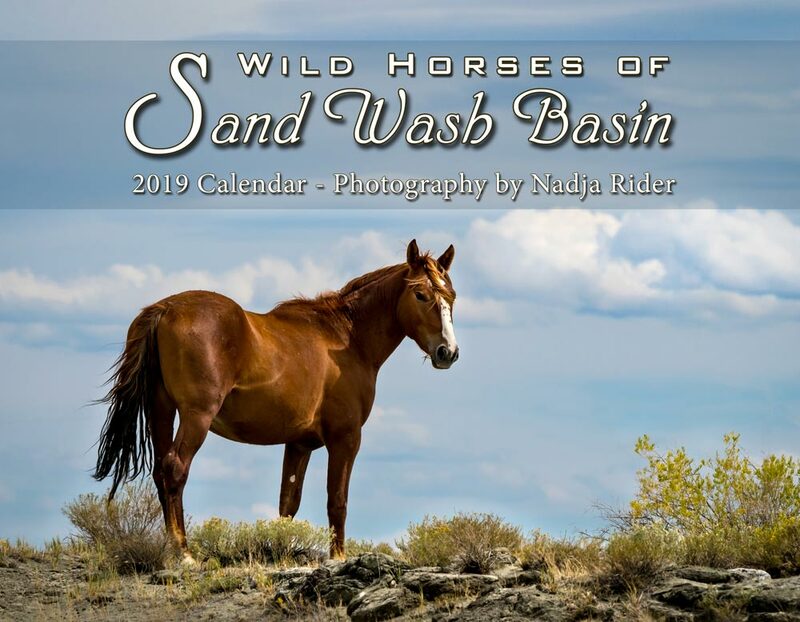 2019 Wild Horses of Sand Wash Basin Wall Calendars! Two beautiful 2019 calendars to choose from. Great collectible and perfect gift for the wild horse fans! All photos include the horse's name. Horses included this year are Picasso, Merlin, Ruby, Snip, Hoot, Pinyon, Brayley, Tango, Yukon, Cognac, Talia, Dawn, Hurricane, Ranger, Tashunka, Capitano, Gold Bar, Sapphire, Indigo, Venus and Mimi. The wild foal calendar features 22 of this year's beautiful foals! These calendars were custom designed and printed in full color. Printed in the USA! A portion of the proceeds will go to Wild Horse Warriors for Sand Wash Basin, a non-profit organization whose mission is to improve the range for the wild horses. 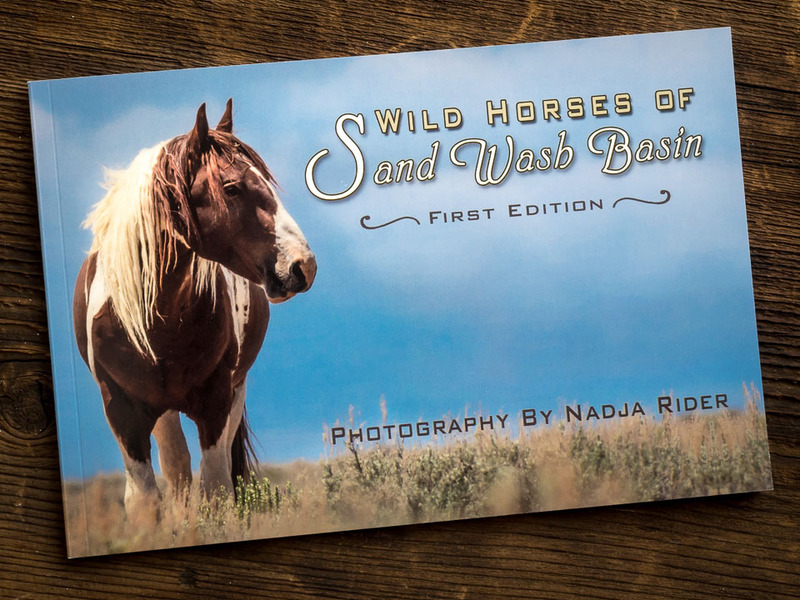 Wild Horses of Sand Wash Basin Photo Book! This book features photos of the colorful Wild Horses of Sand Wash Basin in northwest Colorado. Most photos cover the full page, and includes icons such as Picasso, Corona, Tango, Tripod, Ruby, Flame, Tashunka, Spyder, Cimarron, and many more! View the book with more photos on Etsy. This photography book was custom designed and printed in full color. Printed in the USA! A portion of the proceeds from this book will go to Wild Horse Warriors for Sand Wash Basin, a non-profit organization whose mission is to improve the range for the wild horses. Visit the CreationsByNadja Etsy shop to view and purchase a variety of beautiful items featuring the wild horses of Sand Wash Basin. For additional items, visit Nadja Rider's Photography & Art to view and purchase a variety of home decorator items, such as tote bags, pillows, shower curtains, mugs and much more! Come join the Wild Horses on Facebook! 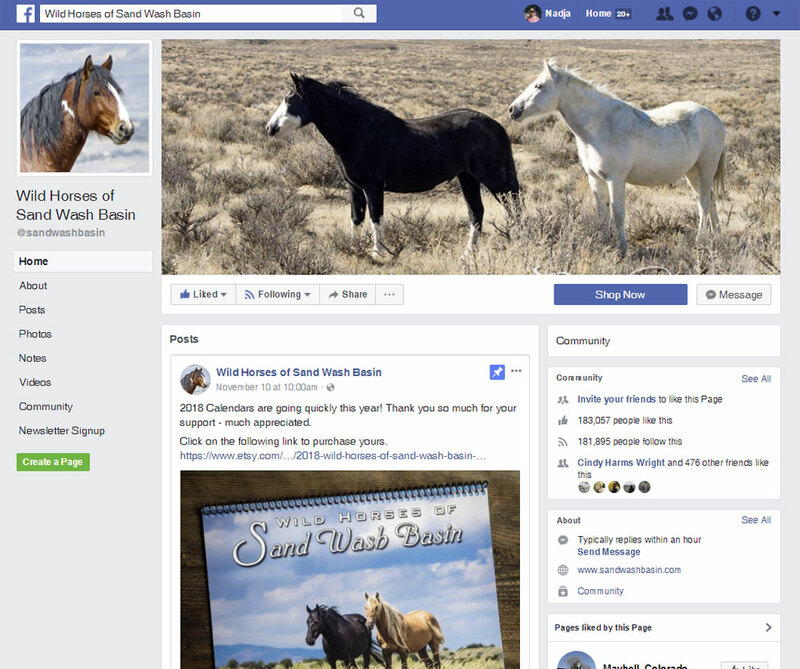 The most active online community for the Wild Horses of Sand Wash Basin with over 186,000 followers! We post new photos daily, along with information, news and updates about the horses as well as Sand Wash Basin road and seasonal conditions. After you visit Sand Wash Basin, come back and visit our Facebook page to share your photos! We love to hear about your adventures and see your great photos! Come join us! To contact us, please visit the Sand Wash Basin Facebook page. 2018 © All Rights Reserved. RiderWeb, Inc.